Died: January 30, 1903, Brooklyn, NY, age 42,---d. at home of acute indigestion, after 48 hours. ---------------------Appeared in 1889 book-------------------------------New York Times' obituary, January 31, 1903, pp. 9. Last edited by Bill Burgess; 02-01-2014, 04:03 PM. New York Times' obituary, April 18, 1944, pp. 21. Last edited by Bill Burgess; 02-01-2014, 03:36 PM. 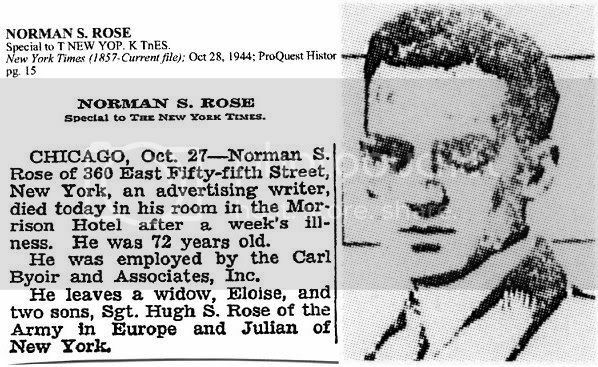 New York Times' obituary, October 28, 1944, pp. 15. Last edited by Bill Burgess; 02-01-2014, 02:04 PM. Died: November 13, 1933, Magnolia Springs, AL, age 77,---d. stroke of apoplexy. Emigrated to the US, August 20, 1868. Conceived The Racing Form, November 17, 1894. On his passport application, he asserted that he had lived in the US, uninterrupted from 1872 to 1919, in Cleveland and Chicago. In 1919, he resided in Evanston, IL, as a journalist. 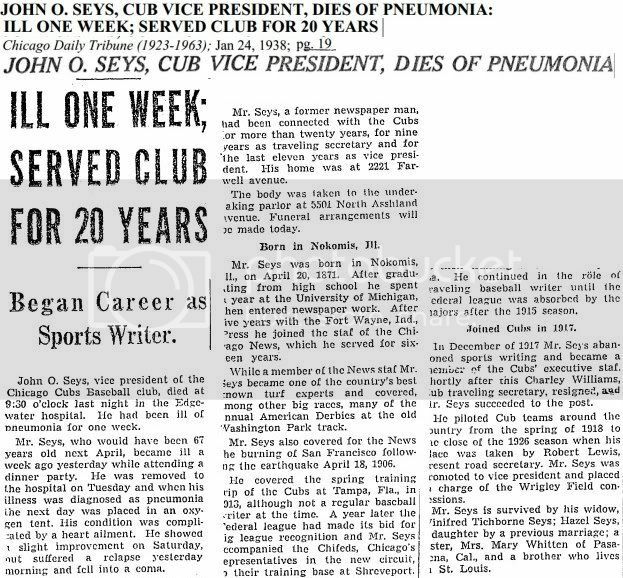 Chicago Daily Tribune obituary, November 17, 1933, pp. 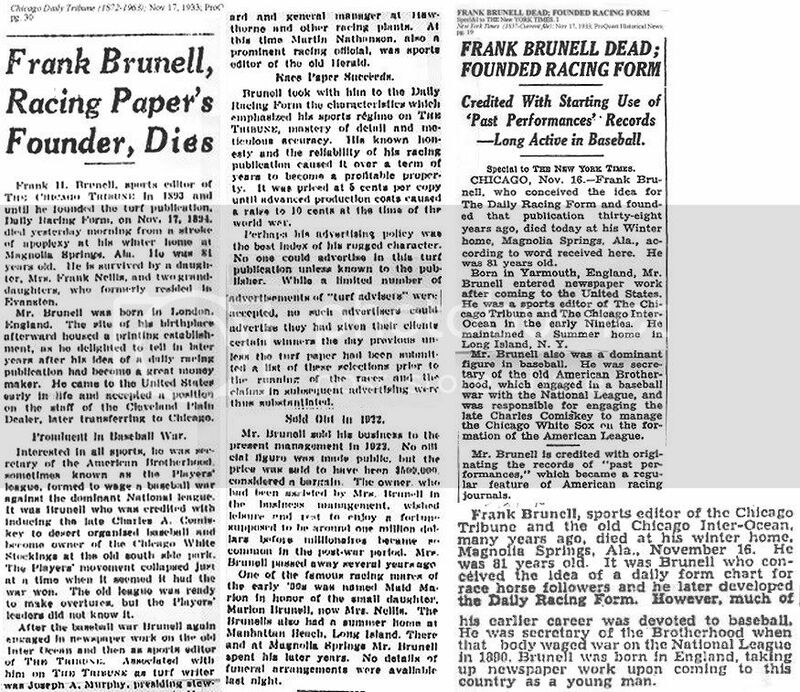 30.--------------------------------New York Times' obituary, November 17, 1933, pp. 19. 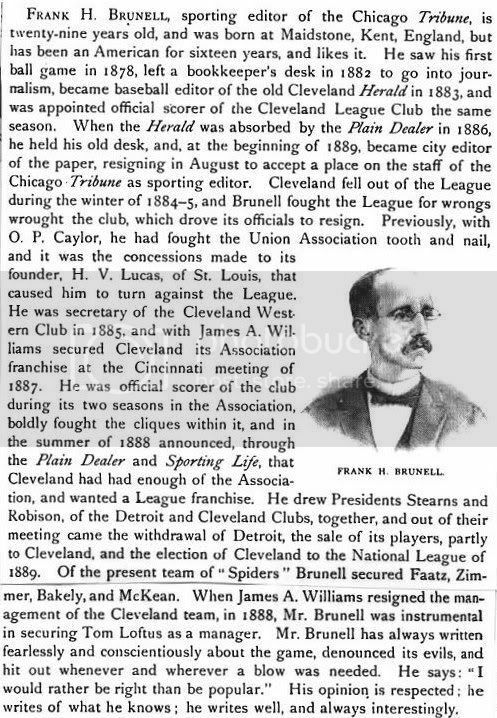 -----------------------Appeared in 1889 book--------------------------Sporting Life write-up, November 5, 1898, pp. 1. Last edited by Bill Burgess; 02-01-2014, 01:38 PM. Died: January 23, 1938, Chicago, IL, age 66,---d. pneumonia, after a week's illness, at Edgewater Hospital. -------------------------------------------------------------------------------------------------------------------------------------Chicago Daily Tribune obituary, January 24, 1938, pp. 19. December 3, 1936, Montreal, Canada: John Seys / Ford Frick. Last edited by Bill Burgess; 02-01-2014, 12:33 PM. 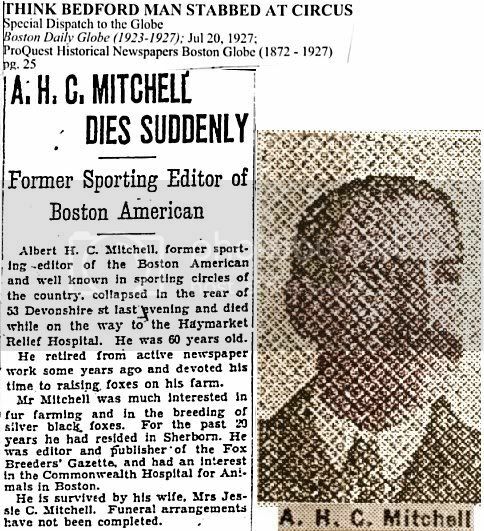 Boston Daily Globe obituary, July 20, 1927, pp. 25. Last edited by Bill Burgess; 02-01-2014, 12:06 PM. Died: October 17, 1971, Quincy, MA, age 63,---d. Quincy City Hospital, after a stroke at home. Father: Robert S. Sr., born Canada, around 1884; Mother: Mary B., born Massachusetts, around 1885; Wife: Dorothy Riley, born Massachusetts, around 1910; Daughter: Nancy (Mantia), born Massachusetts, around 1939; Daughter: Mrs. Joanne Johnston. Last edited by Bill Burgess; 02-01-2014, 11:02 AM. Dan McGrath brings three decades of journalism experience to the Chicago News Cooperative, including more than 12 years as sports editor, associate managing editor and senior writer for the Chicago Tribune. 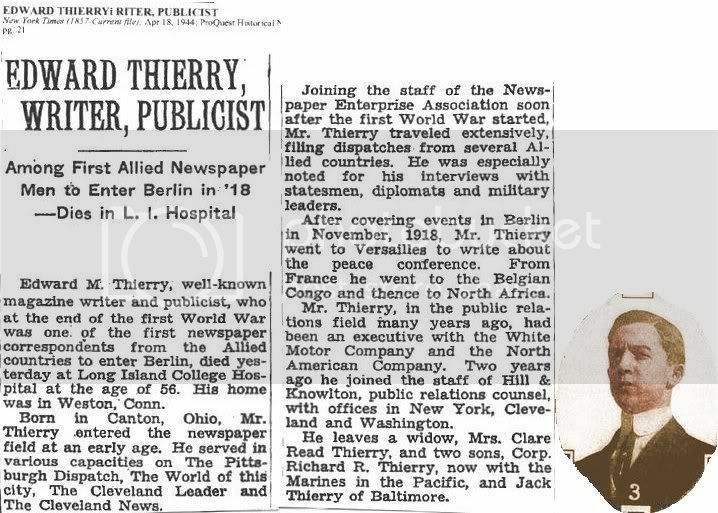 Before joining the Tribune, McGrath worked for newspapers in Freeport, Ill.; Reno, Nev.; Sacramento, Calif.; San Francisco; Philadelphia; and New York. While he has worked most of his career in sports, he also has been a media critic, national correspondent, metro columnist and book reviewer. Sports sections McGrath edited have won more than a dozen top-10 awards from the Associated Press Sports Editors Association. 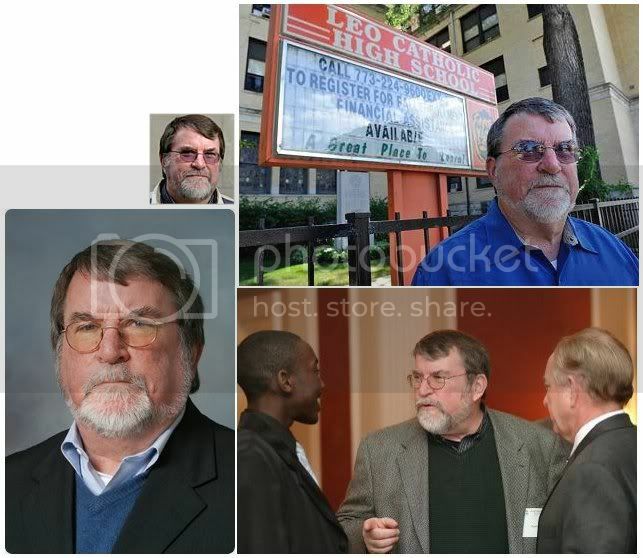 He was nominated for a Pulitzer Prize for spot news coverage in 1992 and for commentary in 1993. A Chicago native, he is the co-author or editor of five books on the city’s sports teams, including the best-selling Out of the Blue on the 2003 Chicago Cubs. More importantly, Mr. McGrath is the husband of Jo-Anna and the father of Megan and Matthew McGrath, as well as the author of "Believe It: The Story of the 2005 World Championship White Sox." Last edited by Bill Burgess; 02-09-2013, 11:19 AM. Died: May 26, 1998, Bayse, VA, age 69,---d. liver cancer, after 1.5 year battle. High school sports in Northern Virginia and Eddie Crane were synonymous over a 30-year period from 1950 until 1980. Crane was a native of Alexandria, Virginia and a graduate of George Washington High School. 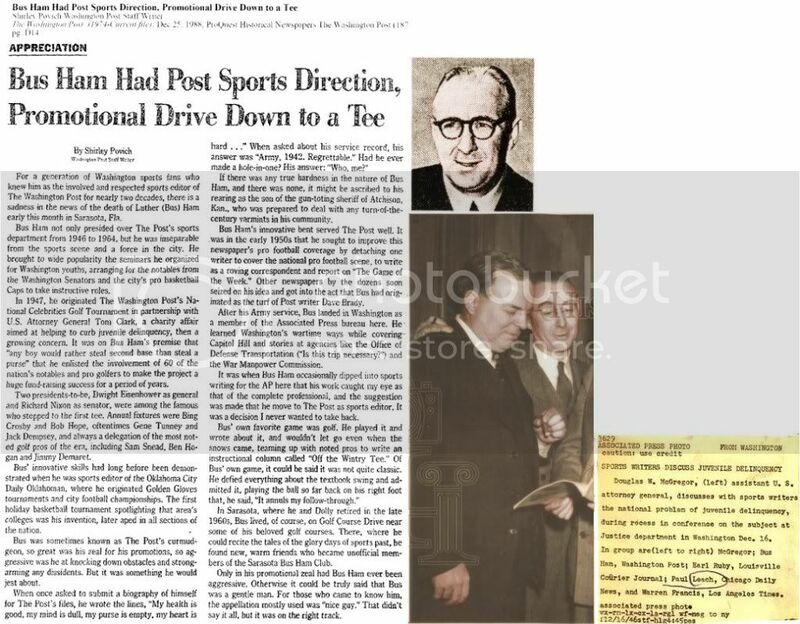 He actually began covering prep athletics in 1943 while a student at George Washington High School. 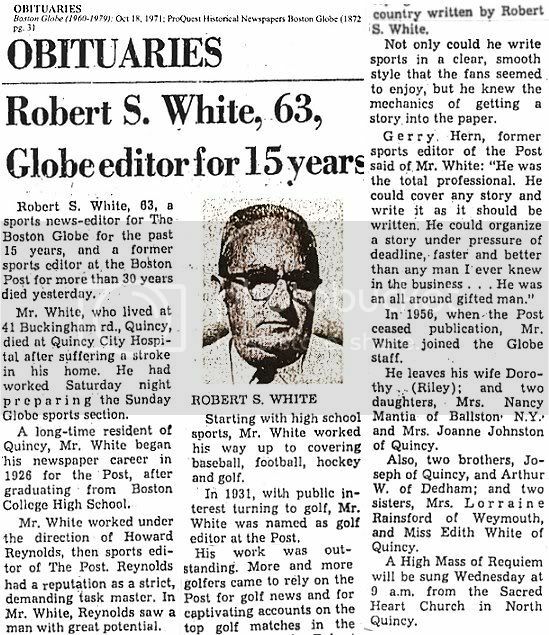 In 1948, he became a full-time sportswriter for the Alexandria Gazette, and served as sports editor for the paper from 1949-60. Crane joined The Washington Star sports staff in 1961, and was appointed scholastic sports editor in 1965, and held that position until the Star’s demise in 1981. Crane’s work pushed high school sports to the public forefront. He helped to find and train stringers at more than 80 area high schools, and coverage expanded to tow full pages of scholastic sports every Saturday, plus a full page each Sunday and increased weekday coverage. Many coaches and school administrators attributed growing interest and larger crowds at high school games to Crane’s efforts. He also conducted sports journalism seminars for the Virginia High School League and was a speaker at the 1978 VSHSADA conference. Among the many honors bestowed upon Crane were the Virginia Sportswriters Association Member Award in 1969, the VHSCA News Media Award in 1981, and the Alexandria Sportsmanship Club Award in 1986. 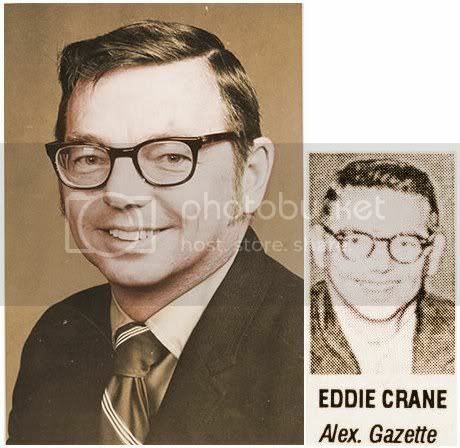 Crane was a co-founder, charter member and president of the Alexandria Grandstand Managers organization that promotes youth sports and president of the Alexandria Sportsman Club. His journalism colleagues, high school coaches and administrators agree that Eddie Crane was invaluable to the growth of scholastic sports in Northern Virginia and the epitome of what we hope to find in a high school sportswriter. ------------------------------------------------------------------------Washington Post obituary, May 28, 1998. Last edited by Bill Burgess; 02-01-2014, 10:40 AM. 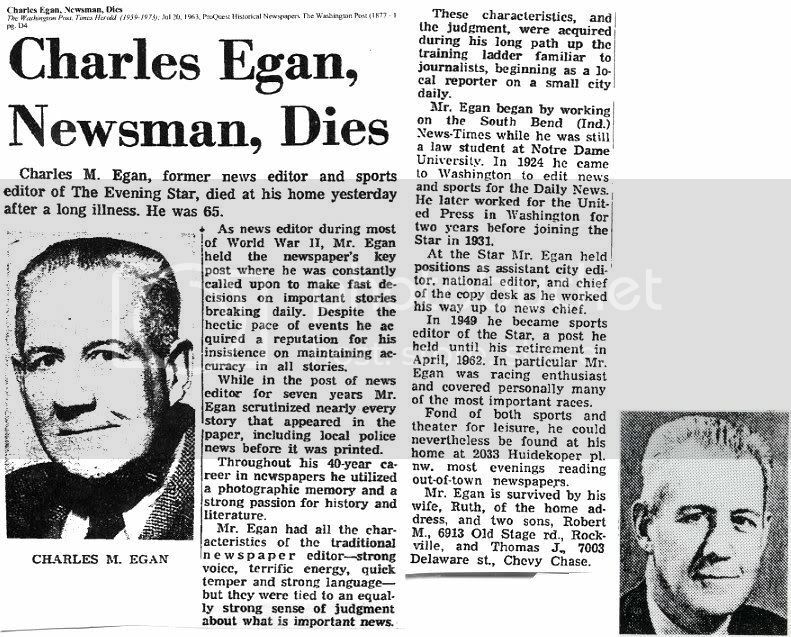 Washington Post obituary, July 20, 1963, pp. D4. Last edited by Bill Burgess; 02-01-2014, 10:04 AM. Died: September 25, 1991, Annapolis, MD, age 85---d. Arundel Medical Center (Annapolis, MD), cancer. Washington Daily News, sports editor, 1947 - 1967, auto editor, 1967 - 1972; he wrote "About autos and racing" column until 1981. Washington Post obituary, September 28, 1991, pp. B5. Last edited by Bill Burgess; 02-01-2014, 09:36 AM. Retired in the late 1960's. His favorite game was golf. Washington Post obituary, December 25, 1988, pp. D14. 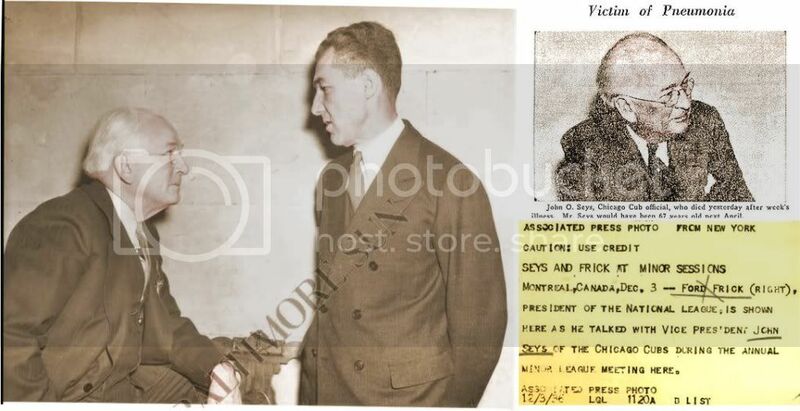 ---------------------------------------------------------------------------December 16, 1946, Washington, DC: Douglas W. McGregor (Assistant US Attorney General / Bus Ham (Washington Post). Last edited by Bill Burgess; 02-01-2014, 08:52 AM. Last edited by Bill Burgess; 01-29-2014, 08:42 AM. Died: July 28, 1938, Chicago, IL, age 61,---d. Chicago Memorial Hospital, after a long illness. Arrived in Chicago in 1905. 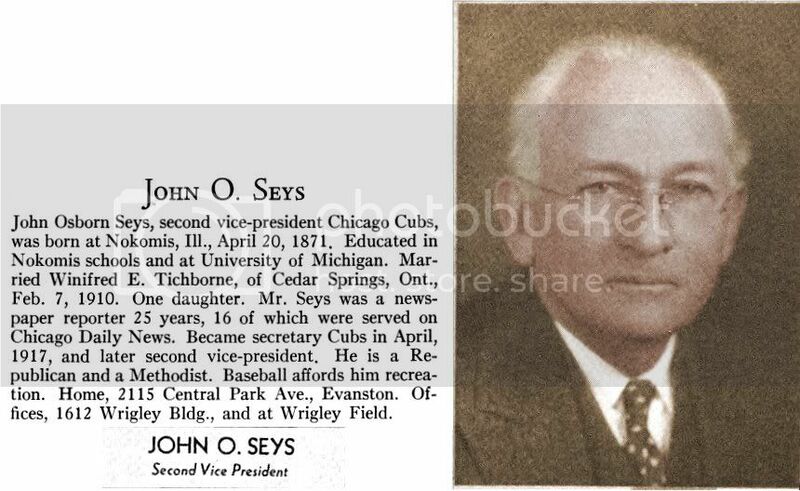 Founded/Publisher of Collyer's Eye, 1913 - 1938. As a young boy he settled in Guelph, Ontario with his parents. Early on in his career as a journalist he would cover stories during the Gold Rush in Alaska, such as the Chilkoot Pass Avalanche in 1898. 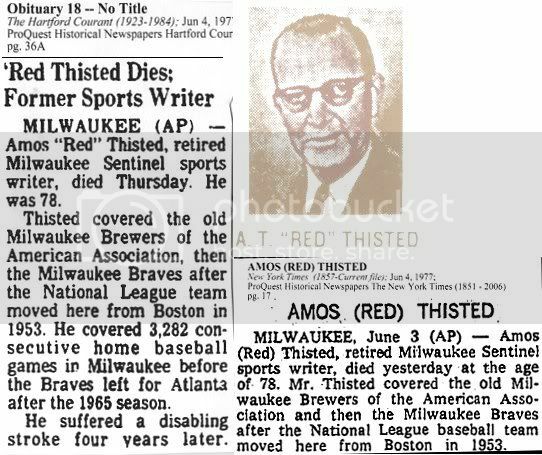 As his writing career grew he would become a sports writer in Chicago. He was known nationally as the publisher of the "Collyer’s Eye" that was first printed in 1914. 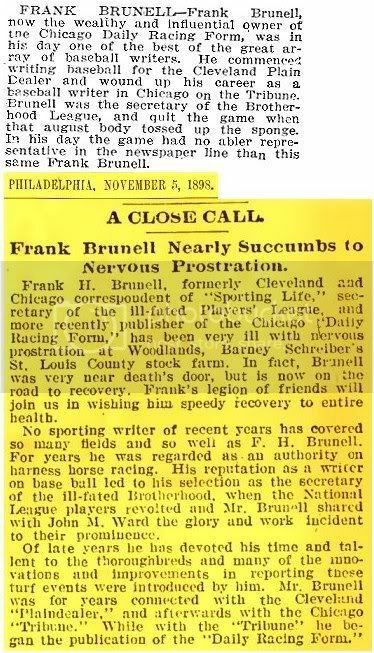 Through this magazine, he would gain international fame as the individual who shocked the world and the American Professional Baseball Leagues when he revealed details of the Black Sox Scandal in 1920. He passed away in Chicago, Illinois, but is buried in Guelph, the place he had always referred to as his "hometown." 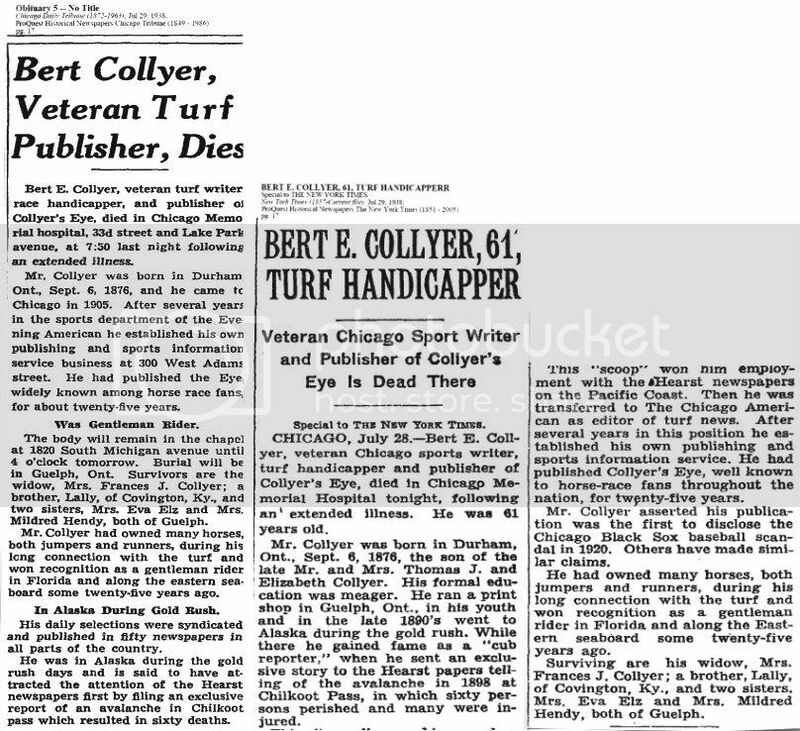 He was also a turf writer and horse race handicapper. Collyer's Eye handicapped horse races and boxers. Chicago Daily Tribune obituary, July 29, 1938, pp. 17.-----New York Times' obituary, July 29, 1938, pp. 17. Last edited by Bill Burgess; 01-29-2014, 08:27 AM. Died: June 2, 1977, Milwaukee, Wisconsin, age 78,---d. suffered a disabling stroke in 1969. Hartford Courant obituary, June 4, 1977, pp. 36A. -------------------------------New York Times' obituary, June 4, 1977, pp. 17. Last edited by Bill Burgess; 01-29-2014, 08:07 AM.